Da Venerdì 24 Novembre 2017 a Martedì 31 Dicembre 2019: Approfittate del 35 % di riduzione! Da Venerdì 24 Novembre 2017 a Martedì 31 Dicembre 2019: Approfittate del 38 % di riduzione! Da Venerdì 24 Novembre 2017 a Martedì 31 Dicembre 2019: Approfittate del 37 % di riduzione! Da Venerdì 24 Novembre 2017 a Martedì 31 Dicembre 2019: Approfittate del 36 % di riduzione! 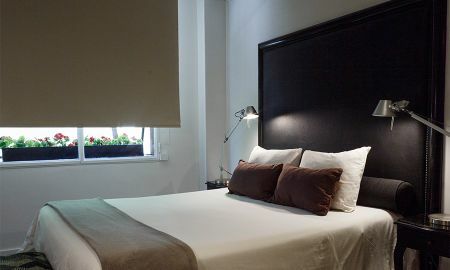 In the heart of Recoleta, a prestigious district of Buenos Aires, this elegant luxury hotel offers a warm and romantic ambience. Recoleta Luxury Boutique Hotel is decorated with precious art works and European unique design elements. The voluptuousness of this luxury boutique hotel invites you to dream, to the glare of the senses. The attention and care brought to the well-being of guests surprise and charm the customer. In a unique atmosphere, intimate and warm, Souvenir restaurant, a high gastronomic place of Buenos Aires, will offer an unforgettable experience for your taste buds: the perfect harmony between a creative cuisine and traditional Argentinean flavors. Room service also allows you to enjoy, in the privacy of your room, the creations of the chef... At dusk, on a background of tango, cocktails and other drinks will be served ... perfect introduction to the night porteña. A stone's throw from the famous Avenue Alvear, a symbol of refinement, luxury and glamour, stands the Luxury Alvear Boutique Style, surrounded by elegant shops, fashion boutiques, art galleries and restaurants. The Ministro Pistarini International Airport is 30 km, Airpark Jorge Newbery 5 km only.